Researchers from Umea University in Sweden evaluated the relationship between poor breakfast habits in adolescence and metabolic syndrome in adulthood. For the study, data from 889 participants was analyzed. At age 16, participants were asked what they had for breakfast. Ten percent of those surveyed were classified as having “poor breakfast habits,” either skipping breakfast, only drinking something energy-containing or only eating something sweet. Twenty seven years later at age 43, researchers followed up with the participants. Waistline size and blood pressure were measured, and blood samples were collected to evaluate HDL cholesterol, triglycerides and fasting glucose. Scientists also collected information on family history of diabetes, alcohol consumption, physical activity and smoking habits. Twenty seven percent of participants had developed metabolic syndrome, conditions that include excess body fat around the waist, high blood sugar, high blood pressure and low “good” HDL-cholesterol. Statistical analysis showed that teens with poor breakfast habits were 69% more likely to be obese and have high fasting glucose in their 40s than their peers who ate a good breakfast. People at age 43 who at age 16 reported poor breakfast habits had a higher prevalence of family history of diabetes, higher alcohol consumption, a higher prevalence of smoking and a lower physical activity level compared with breakfast eaters. The researchers suggest that poor breakfast habits may be part of an unhealthy lifestyle, which would account for these findings. In support of this conclusion, other studies have found that eating breakfast is associated with a better total diet quality and with physical activity. Although the study is limited by the fact that breakfast habits at age 16 are based on a single day’s assessment, this should dilute the effect and lead to an underestimation of association between poor breakfast habits and obesity/high blood sugar rather than the observed overestimation. The researchers suggest that school breakfast programs may be a way to address the issue and should be evaluated to determine metabolic health consequences. Wennberg et al. 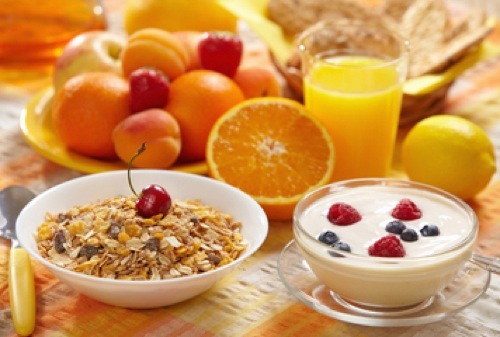 Poor breakfast habits in adolescence predict the metabolic syndrome in adulthood. Public Health Nutr. 2014 Jan 28:1-8.